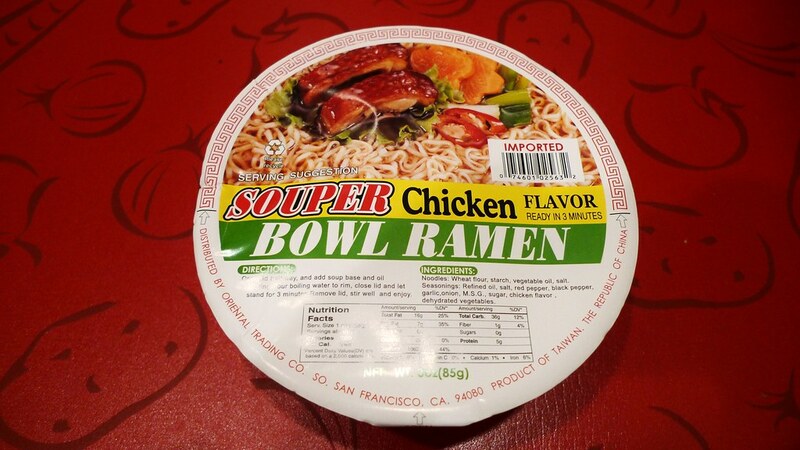 Weilih Food's Souper Bowl Ramen - Chicken. 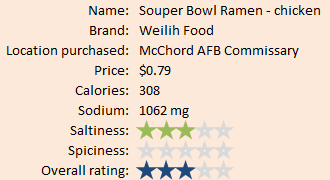 Souper Bowl Ramen is a brand I've always seen near the cheap end of the noodle aisle, but never actually tried. At 80 cents per bowl and an incredibly unattractive package, I wasn't expecting much from this bowl noodle. But on my quest to find new favorites, I must try everything, so here we go. 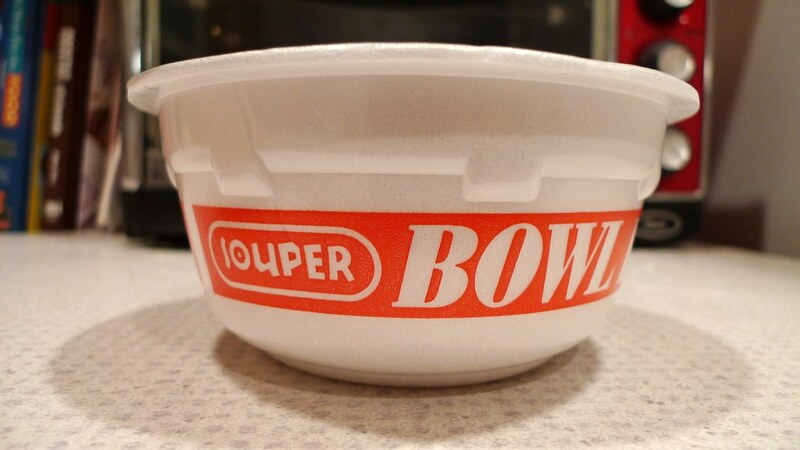 As I said, the packaging of Souper Bowl Ramen is ugly, but I actually think the name is clever, albeit extremely cheesy. The chicken, beef, and shrimp flavors all look the same, with the exception of what meat is featured in the picture. Since I'm not a fan of seafood flavored ramen, I had to pick chicken or beef. Seeing as how I haven't reviewed a chicken item since my very first review, I went with that. 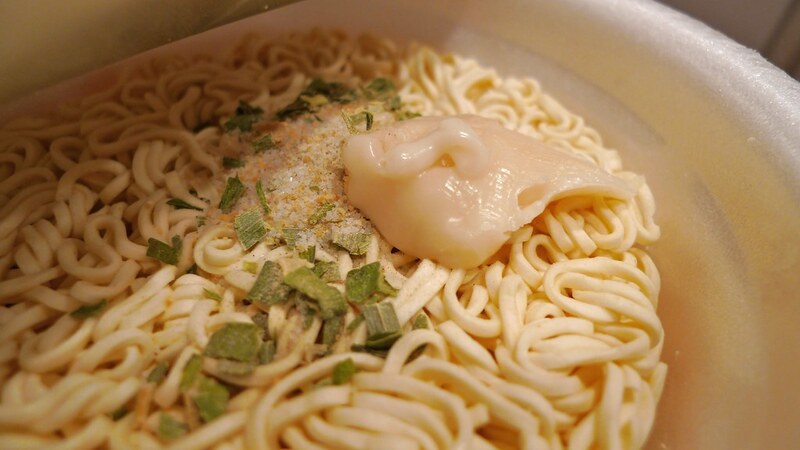 Contents of the chicken flavored Souper Bowl Ramen. 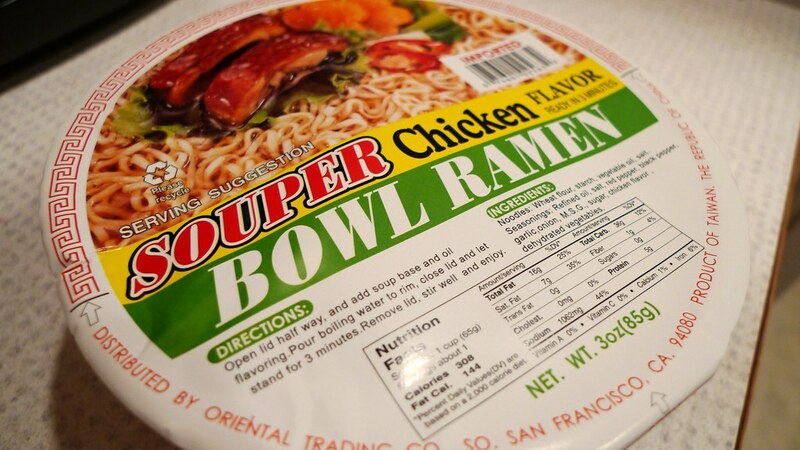 Souper Bowl Ramen is a product of Taiwan, the Republic of China. This is my first Taiwanese product that I'm reviewing. It is made by Weilih Food (維力食品) whose products range from instant noodles to soft drinks, condiments, sauces, cooking oil, and snack foods. 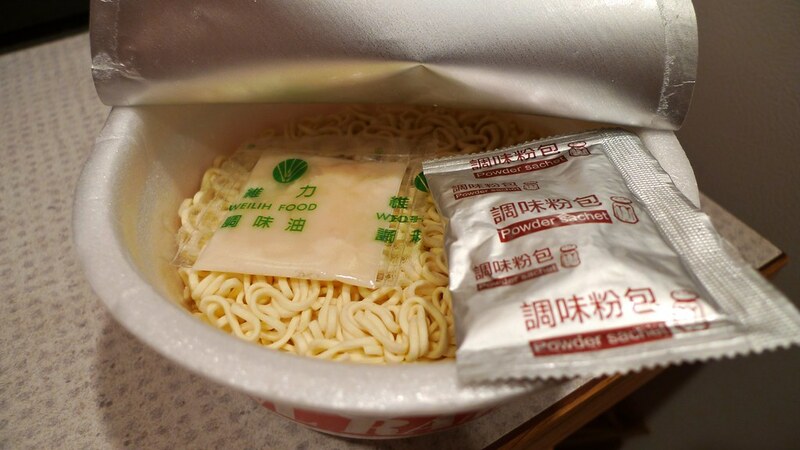 I could not find Souper Bowl Ramen on their website, but it's possible that they use different packaging for the exact same product in Taiwan. It is distributed by Oriental Trading Co. Other than that, I really don't know anything about this product. Um... what's that big glob of gloop in my ramen bowl!?!? 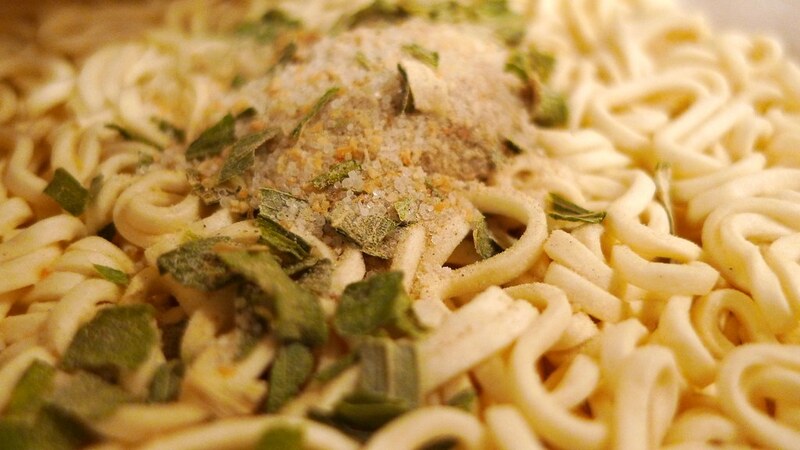 When you peel back the top of the Souper Bowl, you find two packages resting on top of the brick of noodles; the seasoning mix and "oil flavoring". Do not ask me what the latter means. The oil flavoring looks like moldy squished up butter. Feels like it, too. Still, I put it in the bowl before pouring in the boiling water. It turns out that the oily goo melts quite well and the ramen soup has a healthy oily mixture to it. The chicken broth is okay, but the label only lists "chicken flavor" as an ingredient. Looks to me that it's not a natural flavor. Still, I've had worse. It has a strong onion taste to it. 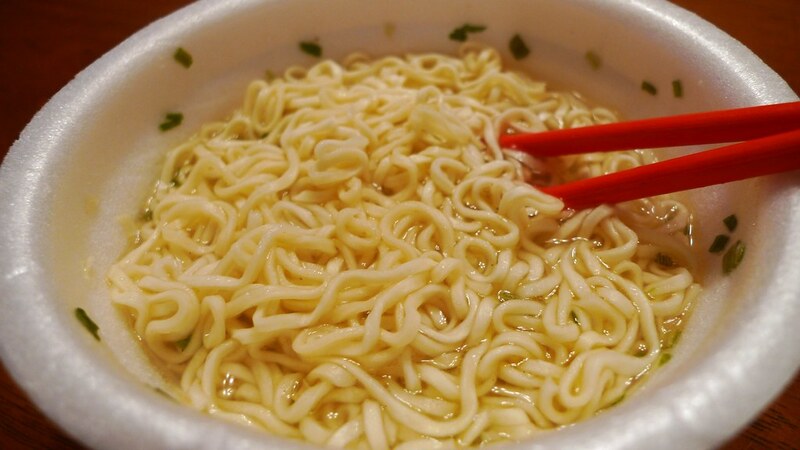 The broth is closer to Ichiban's chicken flavor than Top Ramen's. "Pleasant" will be my last word on it. Ready to eat the chicken Souper Bowl Ramen. 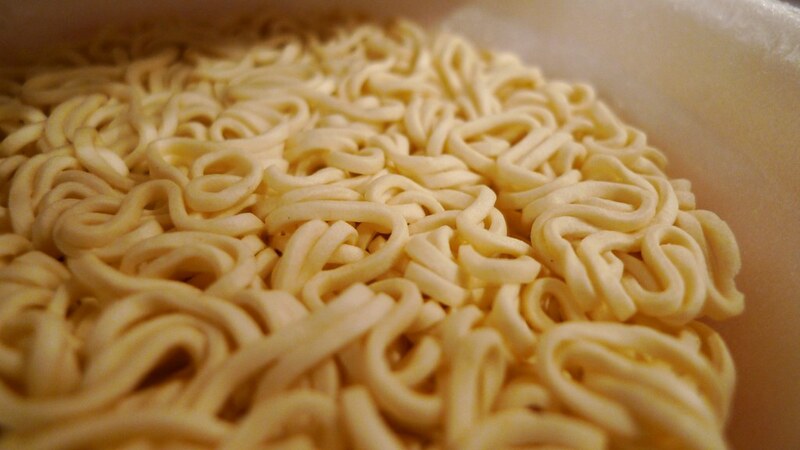 The noodles themselves are thin and flatish. They pick up the flavor of the soup quite well, but I think it's more because of the broth sticking between the thin noodles more than them actually being absorbent. Juliana tried a bowl full of ramen and she liked it, but I could tell that it was not her favorite. She did not finish the serving I gave her. If you need a super quick and super cheap meal to go, Souper Bowl Ramen is certainly a great contender. This is something I could see myself getting once or twice a year. I have been looking for this since my husband got out of the military. I used to buy it at the commissary on base but now we live in Montana and I can't find this anywhere in store or online. Where did you buy this? Thank you for the question. I have not seen these anywhere other than the base and now I am completely separated, so have little chance to find out if they are still there. My parents and my in-laws both have access still (retired) so I can ask for them to check. Let me know how I can get in touch with you if they find it. And thanks for your husband's service! Thanks for the quick response. My email is annie2587@gmail.com.